Tag Archive | "Green Lantern"
This week on the noob news podcast Richard and Christian discuss the newest Green Lantern trailer, Warner Brothers ridiculous plan to remake The Wizard of Oz, as well as wall to wall coverage of the 2010 Austin Comic-con. All this and much, much more on this episode of The Noob News. Warner Bros. Has Started Sending Out Green Lantern Promotional Packages! Pre-Preview of Green Lantern Footage from Entertainment Tonight Online! 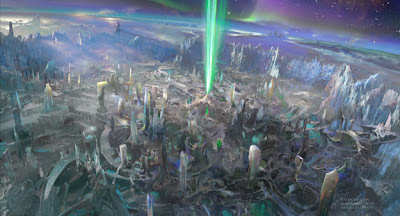 Warner Bros. Pictures has provided us with two pieces of concept art of the planet Oa in director Martin Campbell’s Green Lantern, opening in 3D and 2D theaters on June 17, 2011. The highly anticipated big screen adaptation stars Ryan Reynolds, Blake Lively, Peter Sarsgaard, Tim Robbins, Mark Strong, Taika Waititi, Temuera Morrison, Angela Bassett, Jay O. Sanders and Jon Tenney. The Noob News has learned that Warner Bros. Pictures is looking to shoot Christopher Nolan’s third Batman movie in New Orleans starting in April. We assume that won’t be the only location they’ll be filming, but the studio must like the city after recently wrapping Green Lantern there. Other anticipated movies getting underway include: Men in Black III, which starts filming on October 18 in New York through May; Ghost Rider: Spirit of Vengeance, which will shoot in Romania and Turkey starting in November; the untitled Spider-Man reboot, which begins shooting in Los Angeles in December; and The Avengers, which starts shooting in February in Los Angeles. X-Men: First Class and Captain America: The First Avenger have been shooting in London as well. Charging towards the start gate, but with no set dates yet, are the new Superman movie and Wolverine 2. Stay tuned for many updates on these films over the next two years!